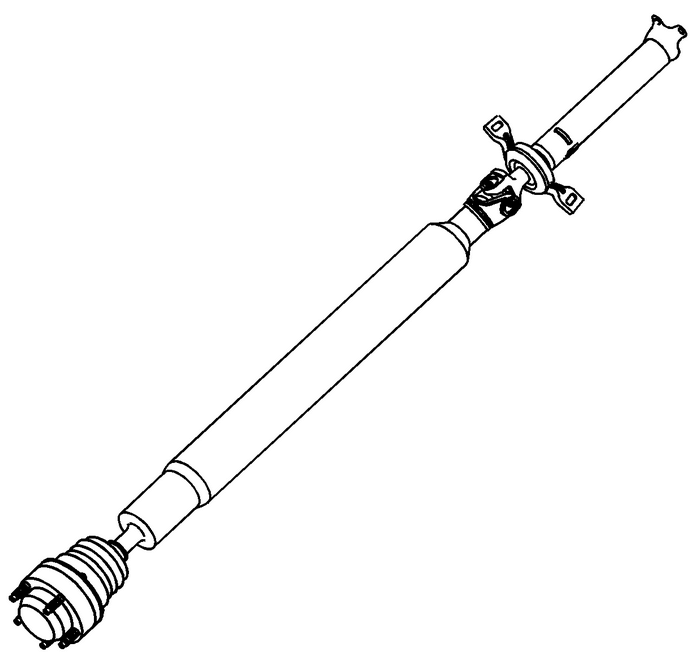 The propeller shaft assembly is a 2-piece design.The front shaft consists of a plunging A-type constantvelocity joint at the front and a universal joint and yoke at therear. The rear shaft consists of a center bearing and a centeryoke, which are pressed onto the rear half of the propshaft andretained by a snap ring. The front and rear shafts are joinedtogether at the yokes with a universal joint. The rear shaftattaches to the axle with a flange which is attached to the rearshaft with a universal joint. The center bearing provides support where the front and rearshafts mate and is bolted to the underbody. The front constantvelocity joint is bolted to the power take-off unit(PTU), and the rear universal joint flange is bolted to the reardifferential.